If you live in our house dinner is a hard thing to decide. We have picky eaters here at the Sanford’s… big and small. Everyone seems to have an opinion on anything we decide to eat. This is a huge reason why we don’t cook that often… but I’m trying to change that. 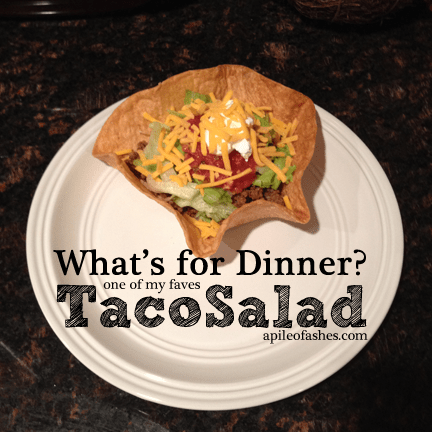 Tonight we made Taco Salads! This made Pastor and I happy but the littles don’t care for them. Now my most favorite of all time is Taco Casa’s Chimalupa they are so yummy. When we go home to Alabama I eat them almost everyday we are there… no lie. But since I can’t have a Chimalupa whenever I want, Pastor Mark’s version is the 2nd best thing. I ate this for dinner on Monday and then lunch on Wednesday. I really wanted some today but there was none left. Oh well there is always next week! Taco Salads are a staple go to food in the Sanford house. It also helps that I have plenty of Taco seasoning in the pantry when we decide a Taco Salad is needed. I made my own and here is how you can too. Here’s how.